With the 5.5-inch iPhone 6 Plus, Apple is arriving late to the phablet game, a niche created and quickly filled with large-format Android offerings from Samsung, HTC, Motorola and more. To its credit, the Cupertino company has held off on a big-screened iPhone because, according to Apple Chief Executive Tim Cook, it wanted to make a "better phone in every single way." The iPhone 6 Plus is big. Getting one in your hands makes that abundantly clear, but the handset is also svelte at 7.1 millimeters thick, with a design that belies the oversized 6.22 inch-by-3.06 inch chassis. That the same general slab of glass with home button design is left unchanged from prior iPhone models helps to minimize perceived gigantic-ness —at least from afar —as most consumers are used to the 4-inch-and-smaller form factor. 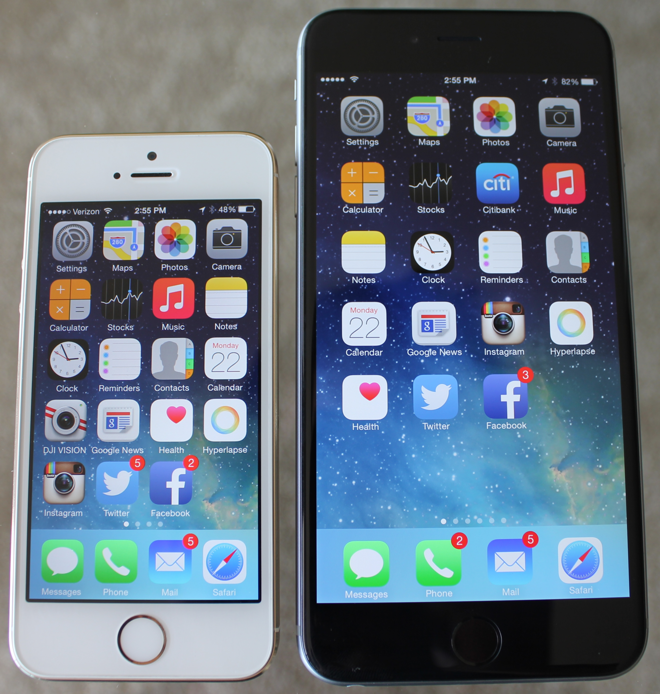 Apple's iPhone 5s (left) and iPhone 6 Plus. Of course, the star of the show is the 5.5-inch Retina HD display, which delivers a 1,920-by-1,080 "2.1 megapixel" resolution (nearly three times the pixels of iPhone 5) at a new 401-pixel-per-inch density. So it is actually "more densely Retina," as well as "more Retina surface area" when compared to an iPhone 5s. The iPhone 6 Plus screen is 2.69-by-4.79 inches, or 12.9 square inches (compared to the iPhone 5 display of 1.96 x 3.48 inches or 6.8 square inches). That results in 89 percent more viewing area, paired with a very significant overall increase in size that makes it feel more like a mini tablet. In addition to outright high pixel density, the display carries over internal plane switching (IPS) technology used in other Apple devices for wide viewing angles that don't sacrifice color accuracy. This year, Apple introduced dual domain pixel technology to better compensate for color fall-off and contrast issues normally apparent when viewing a display from extreme angles. Close-up of iPhone 6 Plus Retina HD display. As noted by AnandTech, the idea is to essentially skew the display's subpixels in relation to the rectangular edges of a display and its LCD array. Situating subpixel groups on varied axes can attenuate lighting inaccuracies during off-angle viewing, allowing for uniform lighting and contrast at nearly any angle. Among the tradeoffs of deploying dual domain pixels is a slight purple cast that could crop up with blacks or darker colors, but we saw no signs of hue shift with the 6 Plus. The iPhone 6 Plus swaps out the flat cover glass found on the iPhone 5s for a slightly curved "strengthened Ion-X" slab with rounded edges. It may seem like a small detail, but the rounding off does create a smooth surface for side-screen swipe gestures. Continuing with a round aesthetic, the screen's curvature flows into the equally rounded sidewalls of the aluminum chassis, creating an effect of fluidity and seamless construction. Whereas the iPhone 5s glass was basically inlaid plastic and rubber surround, the Gorilla Glass on the iPhone 6 Plus is sat atop the case. Apple again fuses the LCD array with the top cover glass to minimize reflections, which translates to a more vivid picture. A new polarizer layer is disposed beneath the display's surface, meaning images will be much cleaner when wearing sunglasses. Previous versions of the iPhone caused problems for some sunglass wearers, as the polarizers used caused color inaccuracy, screen shimmer and other optical artifacts. Since the iPhone 6 Plus uses the same A8 system-on-a-chip as the iPhone 6, performance is nearly identical save for certain graphical operations that require more operating headroom due to the larger screen. 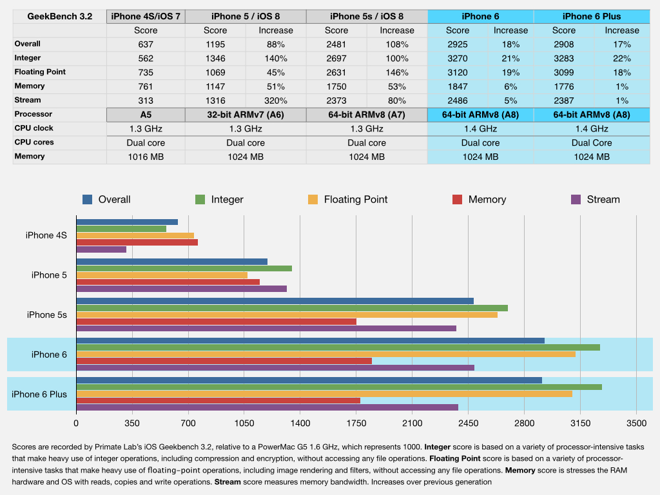 An in-depth look at the A8 and its intricacies can be found in our iPhone 6 review, portions of which are summarized in the charts below. As represented in the Geekbench 3.2 benchmark above, the A8 clocks in slightly ahead of processors used in competing phones. The stats only tell one part of the story, however. With a 64-bit architecture and major internal improvements over the A7, Apple's latest chip is both powerful and efficient. A key difference from other silicon like Qualcomm's Snapdragon lineup is sustained peak processing power, meaning the A8 is capable of being taxed for prolonged periods of time without overheating. 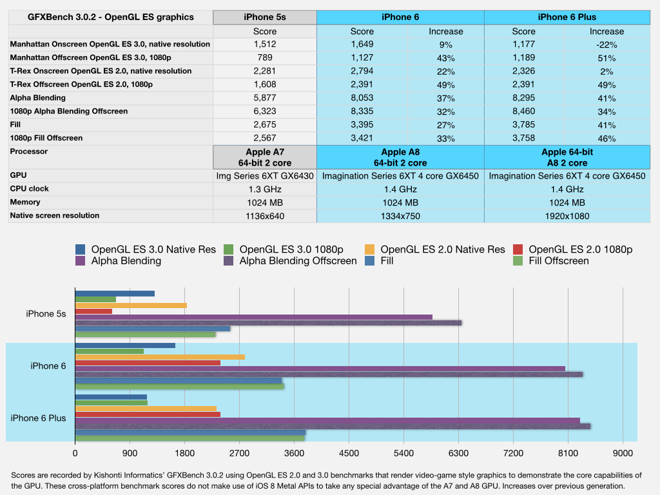 Compared to last year's A7 SoC, the new A8 chews through general CPU benchmarks approximately 18 to 22 percent faster. Also on the die is a new GPU that Apple claims to be 50 percent more powerful than the last-generation package. GFXBench scores reveal 30 to 66 percent improvements on various graphics benchmarks. At its native resolution, however, iPhone 6 Plus can chalk up slower fps benchmarks than last year's iPhone 5s, because it is tasked with pushing so many more pixels. The iPhone 6 Plus also shares a communications package with the iPhone 6, including support for Wideband LTE, which lets carriers use more spectrum to enable faster downloads, up to 150Mbps. Only a handful of U.S. carriers run networks capable of tapping the full potential of Wideband LTE, one being T-Mobile. Additionally, the Plus supports Voice over LTE (VoLTE), which carries both phone calls and data over LTE networks. Verizon and T-Mobile are among the few carriers currently supporting both VoLTE and simultaneous Voice and Data over LTE, but AT&T has promised compatibility in 2015. Apple included the 802.11ac Wi-Fi spec as part of the comms unit and in our tests with an Apple AirPort Extreme router, the Plus reached speeds about 60 percent faster than 802.11n on iPhone 5s. In broadband Wi-Fi tests, the Plus topped out at a little over 92 Mbps, compared to around 29Mbps for iPhone 5s. Results match up with Apple's claim of "up to 3 times faster" wireless speeds. Battery life is surprisingly good for such a large-screened device, and we were able to go two days without plugging in. Apple was able to incorporate a thin 2,915mAh battery pouch into the Plus' chassis and, aside from the screen and case, is the single largest build component. Our usage tests comprised of regular email checks with push notifications, Web browsing, picture taking, video watching and limited gaming. Screen brightness was set to 50 percent and all radios were turned on. Making a large phone usable to the average consumer is no mean task, but Apple has built a few tricks in to iOS 8 that allow for decent one-handed operation, while at the same time maximizing screen real estate with custom user interface components. Apple realized that iPhone 6 Plus owners —like iPad users —would be hard pressed to reach the very top of the screen when going one-handed. 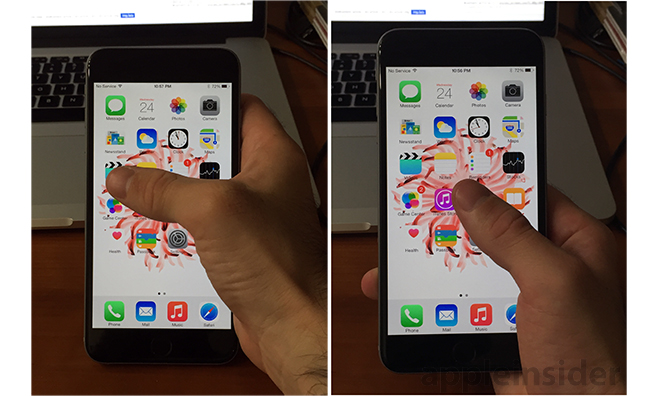 To compensate, the iPhone 6 series employs a new user interface gesture dubbed Reachability. Activated by a double-tap on Touch ID's capacitive outer ring, the system pulls the GUI down toward the middle of the display for easy thumb access. For example, invoking Reachability in Safari will drop the active portion of the screen down for easy Web address entry or targeting of browser controls. Reachability is nearly universal, but does not work with Notification Center's interactive notifications, which is disappointing considering the whole idea behind the drop-down message field is to facilitate quick replies without having to unlock the phone. Making the most out of the Retina HD display, iOS 8 now incorporates a two-up view for certain first-party apps when in landscape mode, a welcome change from the iPhone 6's solution, which is to leave massive amounts of white space unused. As seen below, the 6 Plus breaks out email threads in Mail, shows contacts in Messages and even allows for tabbed browsing in Safari. In addition, the home screen itself can be operated in landscape mode, complete with side-mounted dock. 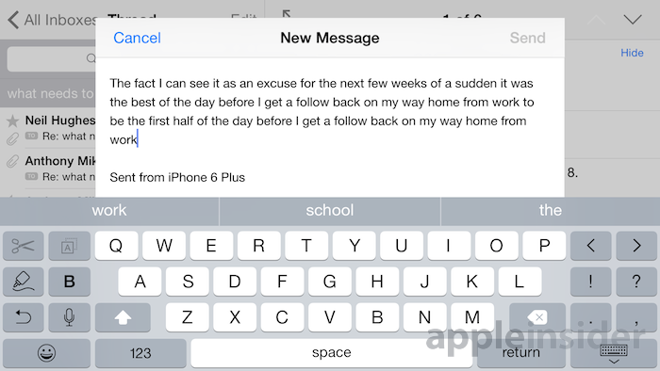 A unique iPhone 6 Plus feature that has been much-discussed since launch is a new landscape keyboard that gets new cut, copy and paste keys for use with other new text selection keys found on the iPhone 6. Hitting shift doesn't replace any of the new keys with additional shortcuts; only the character keys are shifted. The new selection arrows and action keys feel overdue (we think Apple should add them to iPad as well). Like the iPhone 6, Apple has included a "Zoomed" display mode that presents larger graphical assets and text for a less eye-straining experience. Those with aging vision will likely trend toward the larger 6 Plus screen with a Zoomed display setting and possibly even larger text, an option that finally opens up Apple's historically compact iPhone to a new demographic of senior users who have trended toward competing devices from Samsung, as is consistently seen in user research published by Consumer Intelligence Research Partners. The iPhone 6 Plus shares its Sony-sourced iSight sensor with the iPhone 6, while onboard image processing is handled by the A8 SoC. Like the 6, the 6 Plus takes amazing pictures out of the box, but gets one enhancement unavailable on the smaller model. 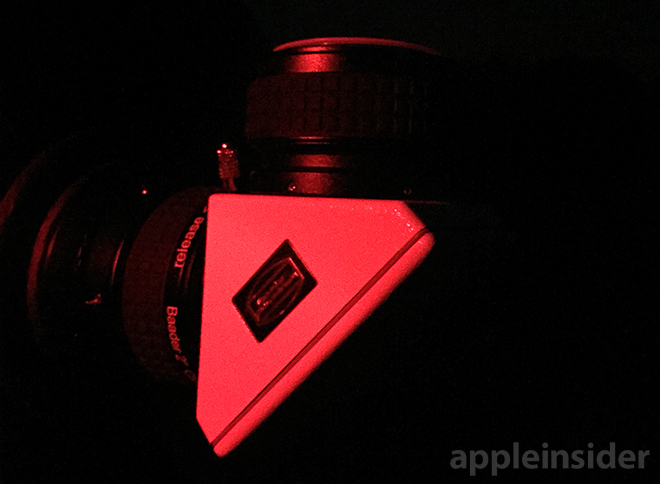 Unedited image taken by iPhone 6 Plus camera in near-pitch black conditions. Apple chose to differentiate the 6 Plus by giving it optical image stabilization (OIS), a hardware solution that minimizes minute movements often present in handheld photography. Apple's solution gathers motion data from the onboard gyroscope and M8 motion coprocessor, then feeds it to the A8 chip's image processor to detect shaking or other movement. Actuators attached to the iSight's lens group receive instructions to counteract shaking motion by moving in equal and opposite directions of detected handset movement. OIS also makes the Plus a formidable nighttime shooter as stabilization lets the shutter stay open for a longer period of time, amplifying the sensor's already impressive light gathering abilities. 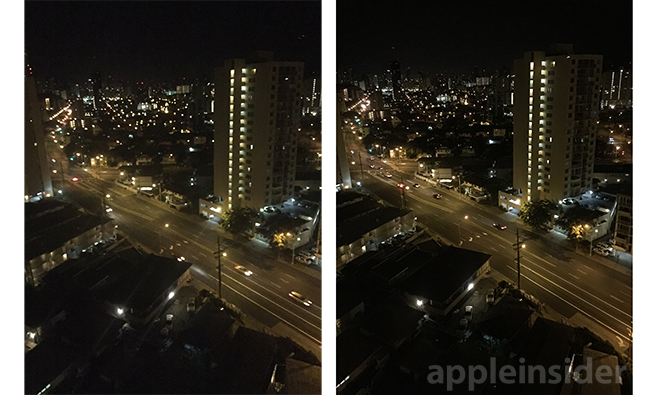 As seen below, the OIS-equipped 6 Plus presents a sharper final product than the iPhone 6 under identical low-light conditions. 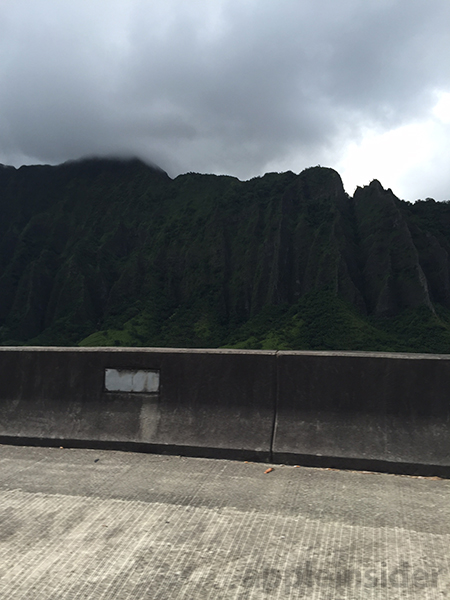 Unedited images out of iPhone 6 (left) and iPhone 6 Plus with OIS. OIS also plays a factor in videography, especially when filming 240fps slo-mo. Due to the fast rate of image capture, the sensor is allowed only a sliver of light per frame, which means the camera must compensate with a wider aperture or higher effective ISO to maintain a noiseless picture. In low-light situations, shooting super slo-mo is nearly impossible with the iPhone 6, but the 6 Plus is more than capable of handling the same dimly lit scenes thanks to the hardware stabilizer. iOS 8 comes with new shooting modes specifically designed for the iPhone 6, including the aforementioned 240fps slo-mo video and 1080p HD video capture at up to 60fps. In addition, users can stitch together time lapse videos to squeeze long time periods into a short clip. Alongside iOS 8, Apple rolled out a new touchless payments system called Apple Pay. Embedded in the iPhone 6 and 6 Plus are NFC radios that communicate tokenized credit card information stored in a secure enclave to a compatible point of sale terminal. Apple is tying Touch ID with each transaction to prevent fraud. For now, the NFC module is off limits for developers, expectedly so as the company is leveraging the hardware for payments, but that may change in the future. Apple Pay works with Visa, MasterCard and American Express, as well as multiple banks, and will be accepted at 220,000 locations when it launches in October. Apple's first foray into the phablet business is largely successful, but we do have a few quibbles with the UI. 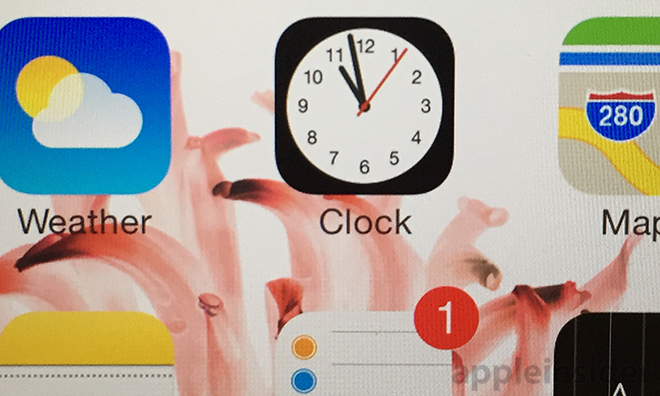 We were hoping Apple could do something innovative with the extra screen real estate, something beyond Reachability. Double-tapping the home button to drop down the UI is a nice feature to have, but compared to the competition, Reachability and a custom keyboard are only minor improvements. That being said, for those attracted to the larger 6 Plus screen, one handed use is likely not even a big issue, given that tens of millions of users already carry around the much larger iPad. If anything, the 6 Plus may serve as a convenient alternative for some to avoid carrying both a phone and an iPad, particularly mobile workers who use iPad-style apps that can be scaled down to work on the 6 Plus screen. 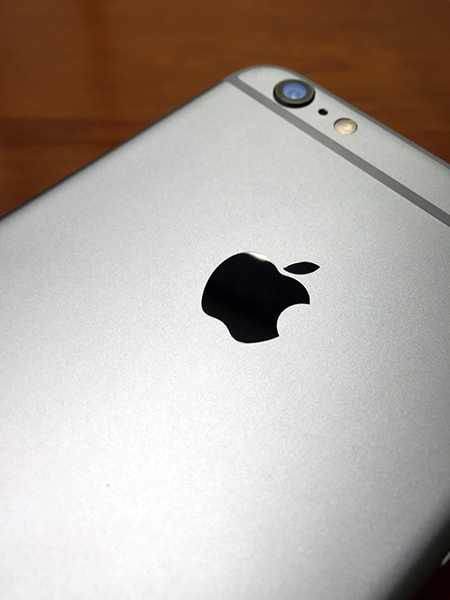 The iPhone 6 Plus is polarizing. For people who want a near-tablet experience, the Plus offers a lot more usable screen space than an iPhone 5s. There's also more to look at when you're perusing photos. And of course many people want (or perhaps need) bigger, more legible type, particularly those with softening eyesight for whom the elegantly small type of past iPhones might be a struggle to read. For some, the ability of the 6 Plus to nearly reach iPad status is a big plus, if carrying such a large phone makes sense for them. The extra screen size and resolution of the 6 Plus will only appreciate as app developers begin releasing optimized apps for it. 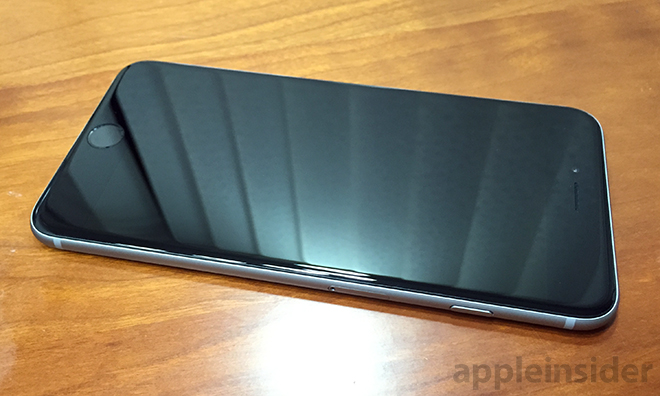 There has been talk of 6 Plus handsets being bent while in a user's front pocket. A YouTube video later demonstrated that the phone's chassis could indeed be made to bend when the right amount of force is applied to the right area, but those results should be obvious to most. Further, we carried around the 6 Plus daily (and even accidentally sat on it) with no damage or signs of flexing. The handset is solid, but just like most smartphones on the market, it has a breaking point. We suggest users handle it as they would any other expensive piece of equipment. With a best-in-class screen, great battery life and an amazing camera, the iPhone 6 Plus has Apple primed to muscle into the phablet niche currently dominated by Android devices. It truly bridges the smartphone-tablet gap without giving up (too much) portability. 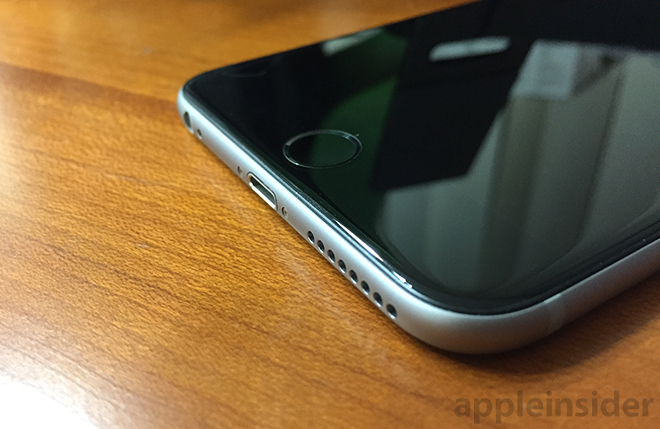 For users that can handle —or want —the girth, the iPhone 6 Plus is an easy recommendation. For those looking to turn in their old iPhone for an iPhone 6, AppleInsider put together a list of cash trade-in offers from top-tier electronics buyback services. With up to $335 in return for used iPhone 4, iPhone 4S, iPhone 5, iPhone 5c, iPhone 5s, or Samsung smartphones, trading in old hardware helps reduce the net cost of a new iPhone 6. Top companies include Gazelle, NextWorth, uSell, BuyBack World, and Amazon. AppleInsider also tracks trade-in prices year-round in its Trade-In Cash Payout Guide. AppleInsider also rounded up a number of new iPhone 6 Plus cases that can help protect your iPhone 6 Plus from drops, dings, spills, and bumps.